The African nation of Liberia has always held a special place in the hearts of Americans. Founded by Americans of African descent in 1848, the capitol city Monrovia was named after James Monroe, the 5th President of the United States. For many years, Americans saw the oldest black African republic as a bastion of democracy on the African continent. In the past two decades there have been a number of civil wars. President Ghankay Charles MacArthur Dapkana Taylor, who won the 1997 presidential elections after an eight-year-long civil war, was never able to fully eliminate rebel groups that sought to oust him by force. During the late 1990s and early 2000s it is estimated that over 200,000 people were killed. The fighting left the country dependent on other nations for food, fuel, and supplies. The renewed fighting forced the humanitarian feeding of the Liberian people to come to a halt as the various non-governmental organizations (NGOs) fled the country. An unsettled domestic security situation slowed the process of rebuilding the social and economic structure of this war-torn country. 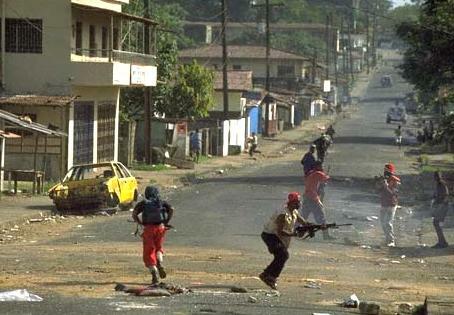 Rebel advances in 2003 culminating with attacks on Monrovia, coupled with two years of UN-imposed sanctions for Taylors meddling in Sierra Leone's civil war, finally prompted Taylors abdication from power in August 2003. One-half of Liberia's three million people were displaced. Taylor became the only person in history (besides Slobodan Milosevic of Yugoslavia) to be charged with war crimes while in office as the leader of a nation. He flew to exile in Nigeria. The United States placed a reward of two million dollars on Taylor, to be paid to anyone who can deliver him for trial in Sierra Leone. A transitional government - composed of rebel, government, and civil society groups assumed control in October 2003. 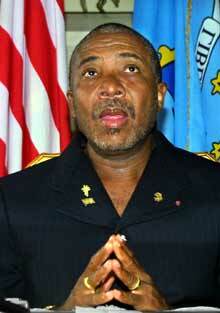 Chairman Gyude Bryant was given a two-year mandate to oversee efforts to rebuild Liberia. In July 2003, the two main Liberian rebel groups launched an all-out offensive to remove Charles Taylor as the president of Liberia. The fighting between rebel and government forces was often marked by roving bands of armed, drugged-up young men shooting indiscriminately and robbing defenseless civilians. Both sides employed thousands of child soldiers. Close quarters urban combat killed over a thousand civilians in the July fighting alone. 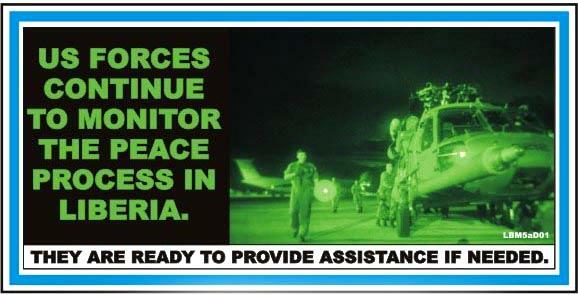 In July 2003, following a cease-fire, the U. S. Army Southern European Task Force (SETAF) was directed to establish a joint task force (JTF) and provide support to military forces of the Economic Community of West African States (ECOWAS) as it led peace support operations in Monrovia, Liberia. ECOWAS, Britain and France asked the United States to lead a peace-keeping operation designed to separate and disarm the warring factions and establish an environment where a transitional government could take control of the country. ECOWAS pledged 3,000 troops for an intervention force and asked the United States to pledge 2,000 troops in this effort. President Bush agreed. 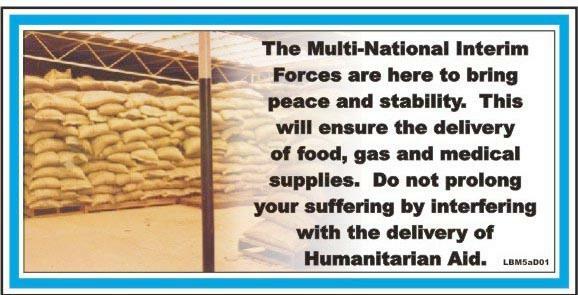 JTF Liberias was assigned the task of helping to prevent a humanitarian disaster and create a secure environment for humanitarian organizations to resume operations in Liberia. 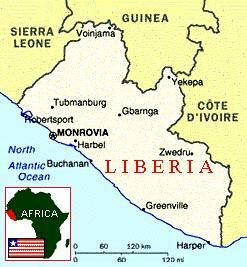 JTF Liberia began deploying forces to Africa in late July. 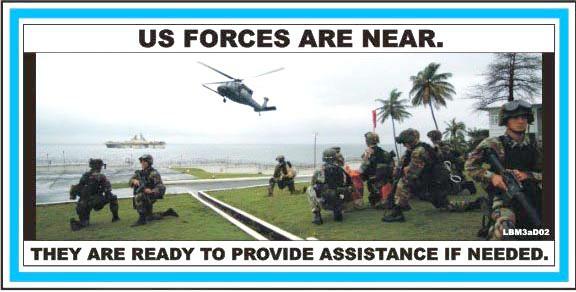 At its apex, JTF Liberia consisted of over 5,000 service members from the SETAF headquarters, the 26th Marine Expeditionary Unit, the three-ship Iwo Jima Amphibious Ready Group, 3rd Air Forces 398th Air Expeditionary Group, U. S. Army Europes 21st Theater Support Command, and the Armys 1st Battalion, 10th Special Forces Group (Airborne). On August 4, the JTF deployed a 45-member forward headquarters to the USS Iwo Jima positioned off the coast of Liberia. 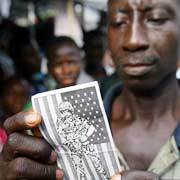 The U.S. promised to commit troops to Liberia after President Charles Taylor stepped down from power and left the country. Taylor went into exile in Nigeria on August 11. Within minutes, U.S. warships were visible from Monrovia's port. Marine poster LB88aC02  Stop! Secure Area! Keep Away! JTF forces first went ashore on August 14. About 150 marines from the 26th Marine Expeditionary Unit first deployed to Roberts International Airport as a quick reaction force. Another 80 marines deployed to the free port of Monrovia to conduct engineering work needed to open the port to humanitarian relief. From August 14 through the end of September, JTF Liberia aircraft conducted armed presence patrols over the skies of Monrovia and outlying areas to assure the Liberian people that the war was over and to reiterate to the former warring factions their responsibilities under the cease-fire. The Liberian civil war formally ended with the comprehensive peace agreement signed in Accra on August 18. US military planes and helicopters carried the last few American ground forces out of war-ruined Liberia on 1 October 2003. The US Marines' departure was part of the transfer of peacekeeping responsibility from a 3,000-plus West African force to a United Nations force of up to 15,000. The 6th PSYOP Battalion (6 POB) deployed a five-man PSYOP Support Element (PSE) to Vicenza, Italy. These elements enable tactical commanders to communicate directly with the enemy and foreign civilians. 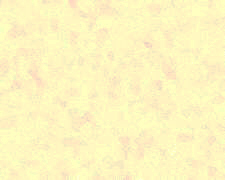 At the same time, the Product Development Center (PDC) was making and sending PSYOP products via "Reachback." The product (or psychological) Development Center, is normally the regional PSYOP unit that designs information products and programs and makes recommendations on psychological actions in support of military and national objectives. Reachback is a term used for the ability to exploit resources, capabilities, and expertise not physically located in the theater or joint operations area. In the case of JTF Liberia, the leaflets were prepared at Ft. Bragg, and then forwarded via Siprnet to Vicenza. Siprnet is the secret Internet protocol router network. In plain English, Siprnet is a private classified network that is physically separated from the Internet. The leaflets were reviewed in Vicenza and then sent to the U. S. Embassy for approval and the Iwo Jima for printing by the Navy. This was a quite complicated procedure as the PSYOP had to be coordinated and approved by the U. S. Army European Command, the Iwo Jima, the U. S. Ambassador and Monrovia. The 6th PSYOP Battalion was assigned two loudspeaker team attachments, which were deployed to the Iwo Jima. There performed some missions on the ground in Liberia, and were critical in helping the U. S. Navy print the PSYOP products aboard ship. The major in charge of the PSYOP element went to the U. S. Embassy where he eventually became a key advisor to the U. S. Ambassador. The PSYOP element redeployed after a few weeks, but the Major at the embassy stayed in-country for another two months. In doing the products, I based my designs on what the PSYOP troops envisioned. They told me the kind of images they wanted and I put their basic concepts on paper. It was a team effort. We put the products together with their concepts and my design skills. 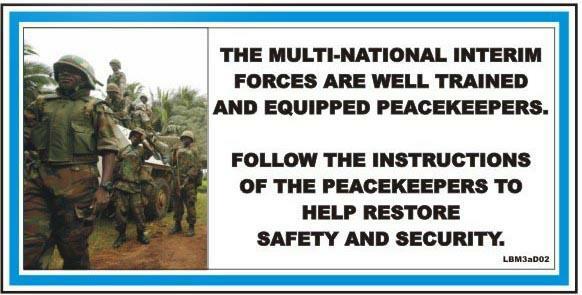 We were there as peacekeepers. We were there to tell them to play nice and to get along. It was proven by the end of the war that the messages we gave them helped. We gave them good visual images and basic, simple words for them to understand their situation and the consequences of their actions. The most difficult aspect of the operation for us was that when we started out we weren't on location. We were in a different time zone so it was difficult to get an immediate response from the U.S. Embassy and to learn the reactions of the local people. Towards the end of our mission we ended up erecting billboards so that everyone could see how the U.S. and the U.N. were just in Liberia to help. I think it was a successful mission. They now have a new president and things seem to be getting better. U. S. Troops are authorized to use deadly force, if necessary, to carry out their mission. To avoid an incident, keep away from the embassy compound. When in the vicinity of the embassy, make no sudden movements or threatening gestures. U. S. Troops are authorized to use deadly force. In addition to facilitating logistical support, the JTF played a central role in information operations. Contending with reams of information, periodic outbreaks of fighting in the countryside, rumors and misinformation, the JTF had to aggressively conduct information operations or risk the mission unraveling. The information operations working group, located at the JTF main headquarters, developed plans and information products for the JTF forward staff to coordinate through the country team. These products included public service announcements, radio broadcasts, leaflets and newspaper advertisements. These products were critical to gaining public support as well as shaping the environment for the arrival of U.N. forces. 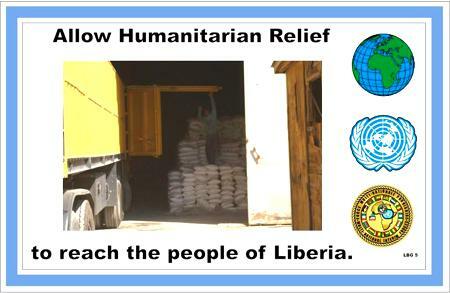 During JTF Liberias two-month deployment to Liberia, a peace agreement was implemented; forces of the warring factions were separated; air and seaports were reopened; and the United Nations and private humanitarian organizations resumed delivery of badly needed relief. With a humanitarian catastrophe averted and the arrival of United Nations peace-keeping forces on October 1, the mission of JTF Liberia was accomplished. An unqualified success, this mission serves as a highly successful model for future support and stability operations. JTF Liberia was a very, very successful mission. We did what we were asked to do. We stopped the fighting, and we diverted a potential humanitarian disaster. Because weve been so successful, Liberia has hope. The U. S. Army Southern European Task Force (Airborne), as the core of the Joint Task Force (JTF) Liberia headquarters, was awarded the Joint Meritorious Unit Award on 29 January 2004 for its role in the U. S. humanitarian relief effort in Liberia. In addition, service members who took part in JTF Liberia from 25 July to 15 October 2003 where eligible for the Army Humanitarian Service Medal. A few final words about President Charles Taylor who was forced to flee Liberia and granted exile status in Nigeria. In early 2006 it became clear that the world-wide demand for his arrest and prosecution was making headway in Nigeria and there was the possibility that he would be arrested and handed over to the authorities. He was wanted by an international tribunal to stand trial for crimes against humanity and Nigeria had announced it would hand Taylor over to a UN-backed Sierra Leone tribunal to be tried for alleged war crimes. He somehow slipped away from his guards and as a result all 22 Nigerian police officers responsible for guarding Taylor were arrested. On 27 March he was caught at Nigeria's southern border trying to cross into Cameroon, the traditional route through to Chad. There were two large 110-pound bags of dollars and euros in the car with the former dictator. Taylor, accused of fomenting two savage wars, will be the first African leader to face trial for crimes against humanity. While the Sierra Leone tribunal's charges refer only to the war there, Taylor also has been accused of starting civil war in Liberia and of harboring al-Qaida suicide bombers who attacked the U.S. embassies in Kenya and Tanzania in 1998, killing more than 200 people. His son, Charles McArthur Emmanuel, was arrested just three days later on passport fraud charges after landing at the Miami, Florida airport. As always, the author encourages readers to write with comments or questions. Very little has been written about the PSYOP campaign in Liberia, and except for a few leaflets, we have no information on the units involved or the specific operations. 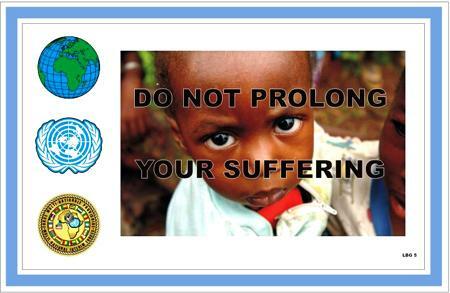 Readers who took part in JTF Liberia are especially invited to add their comments to this article. Kindly send your comments to sgmbert@hotmail.com. Note: In October 2008, former Liberian President Charles Taylor was put on trial by the United Nations War Crimes tribunal in The Hague, Netherlands. Taylor was charged with orchestrating atrocities by rebels in Sierra Leone from 1996 to 2002 while he ruled Liberia.